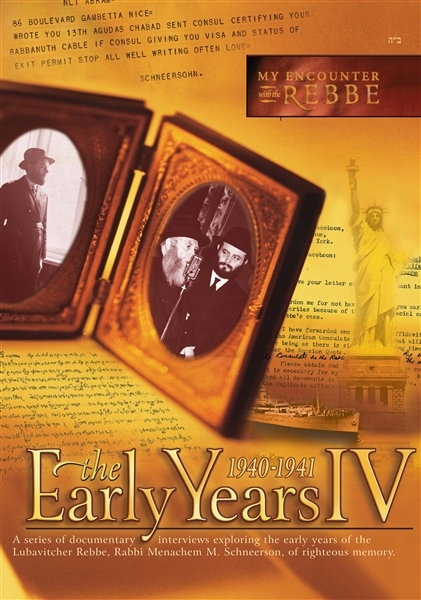 More than an hour long, The Early Years Volume IV sheds unprecedented light on the Rebbe and Rebbetzin's flight from the Nazis in 1940-1941. Preview The Early Years 4. Until now, the private life of the Rebbe, Rabbi Menachem M. Schneerson, has been shrouded in mystery. Based on first-person testimony from the oral history project, My Encounter with the Rebbe, The Early Years Volume Four sheds unprecedented light on the Rebbe and Rebbetzin's flight from the Nazis in 1940-1941. Europe was in turmoil amidst Germany's attacks. And the Rebbe and Rebbetzin were desperately trying to get away, like so many of their brethren. Watch first-person testimony recounting the events of the Rebbe's travels from Paris to Vichy and then to Nice, during the Nazi occupation of France and the rule of their puppets, Petain's "Vichy Government." As the couple fled for their own lives, they helped other Jews, hauled with them precious manuscripts of the previous Chabad Rebbes, and kept the Torah and its commandments under impossible circumstances. The filmmakers have discovered new documents in archives in the US and Europe, shedding unprecedented light on this period in the Rebbe's life. They were also granted remarkable access to the archives at Lubavitch World Headquarters, enabling them to present documents which have never been seen, until now.